UFC® will return to Philadelphia for the first time since 2011 with a bout guaranteed to deliver fireworks, as No. 6 ranked lightweight contender Edson Barboza takes on No. 7 Justin Gaethje. In a pivotal strawweight bout, No. 6 ranked contender Karolina Kowalkiewicz faces No. 8 Michelle Waterson. UFC FIGHT NIGHT® ON ESPN: BARBOZA vs. GAETHJE takes place at the Wells Fargo Center on Saturday, March 30. 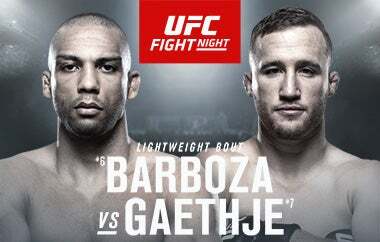 Tickets for UFC FIGHT NIGHT® ON ESPN: BARBOZA vs. GAETHJE go on sale Friday, Feb. 8 at 10 a.m., online at WellsFargoCenterPhilly.com, by phone at 1-800-298-4200, or in person at the Wells Fargo Center box office.